The official NCAA March Madness 2015 app has been updated with a refreshed look for this year’s tourney. The app takes on some of Google’s Material Design, but overall, just looks a lot more modern than in past years. The app itself isn’t doing much at the moment, but will come Sunday when the brackets are set. Once that happens, you’ll be able to join the official Capitol One March Madness Bracket Challenge, make picks, check scores, learn about all the Cinderellas, find the best storylines, and of course, watch all 67 games live. Updated for the 2015 tournament with a refreshed look and feel. NEW: Satisfy your team fan loyalties, learn about the Cinderellas, and research your bracket with the all-new team pages. NEW: Featured section allows fans to discover the tournament’s best storylines and relive classic March Madness moments. 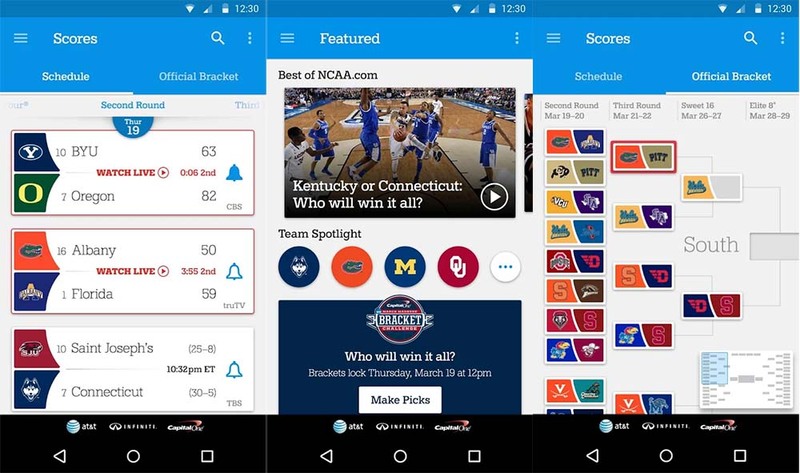 NEW: It’s never been easier to make bracket picks on your phone. Choose between list view for quick picking and bracket view for that timeless look and feel.